The patented Accu-CT split-core current transformer technology delivers exceptional linearity and low-end accuracy. Developed specifically for solar inverter, variable speed motor drive, and other applications where there are large variations in current. 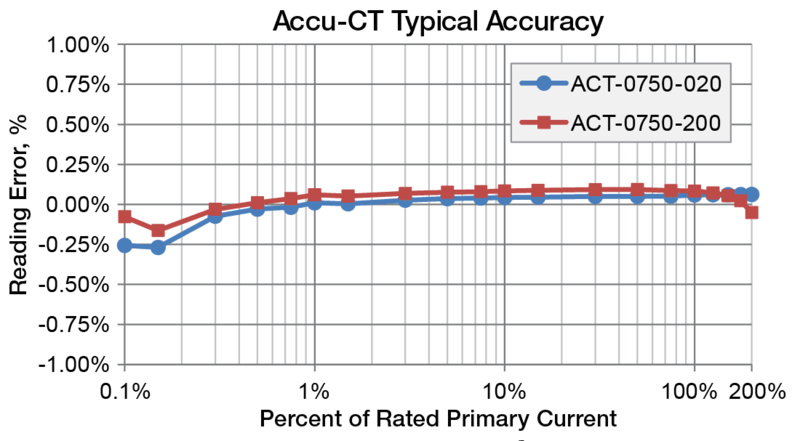 The 100:1 turndown ratio of Accu-CTs is ten times better than industry standard CTs. The unique one-handed opening and closing mechanism makes installation a snap. ACTL series CTs are available in both standard and revenue-grade accuracy models. Revenue grade models ship with a serialized certificate of calibration. Safe: built-in burden resistor provides 0.333 Vac voltage output at the rated full-scale current—no shorting blocks needed! Max Amps is the recommended maximum continuous current. 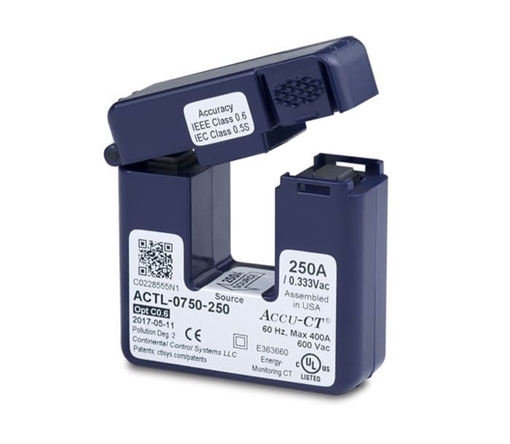 See ACT-0750 Maximum Amps for details. Note: the ACT-0750-250 Opt C0.6 accuracy is only specified to 100% of full-scale primary current (other models are specified to 120%). 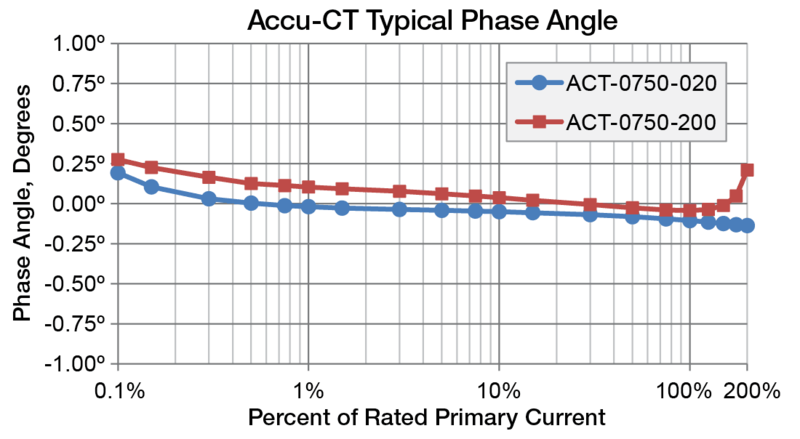 Phase angle improves to ±0.5 degrees from 1% to 120% of rated primary current from -30°C to 55°C. 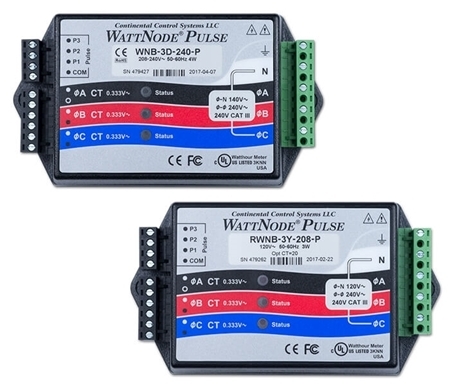 Not available for 5, 15, and 20 amp Accu-CT models. Standard models are calibrated for optimum accuracy at 60 Hz. Option 50 Hz calibrates for best accuracy at 50 Hz. Option 50 Hz models have the same accuracy specifications as standard models and are also available in combination with Option C0.6 (selected rated amps) for higher accuracy. The accuracy specifications apply over the full operating temperature range (-30°C to 55°C) unless otherwise noted. Standard models are calibrated for optimum accuracy at 60 Hz. 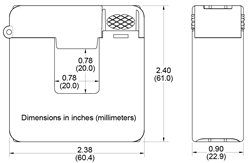 For use with 50 Hz services, we recommend ordering with Option 50Hz. Note: The ACT-0750-250 Opt C0.6 specifications apply at 120% of rated current only at temperatures of 40°C and below.